How many unemployed persons receive unemployment benefits? It's a question I couldn't immediately answer, so I poked around the Department of Labor's website until I found the relevent data. The chart below tells us that about 60% of the unemployed were receiving unemployment benefits in August 2011 on a rolling 12-month basis (to remove seasonal effects). The benefits data is from a DOL spreadsheet that compiles unemployment benefits data across all programs [ xls ]. The number of unemployed persons is from the unadjusted unemployment level data published as part of the BLS Current Population Survey. The chart is also a good reminder that not all unemployed persons can claim unemployment benefits. 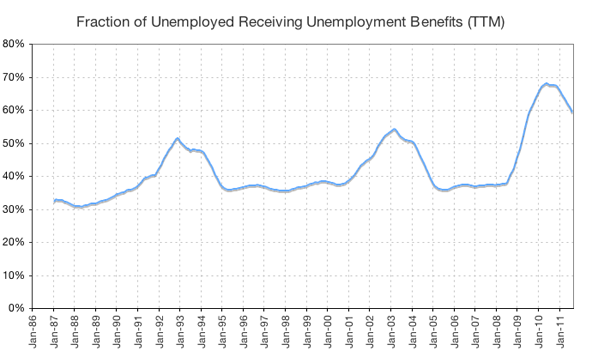 Of the nearly 14 million unemployed in August of 2011, a rough estimate suggests that around 5.6 million were not receiving benefits (it's rough because I'm estimating from a moving average which is inherently lagged). The unemployment insurance program is complex and evolving, but the Center on Budget and Policy Priorities has an excellent overview of unemployment insurance if you're interested in learning more about the mechanics of the program.